Phillip Johnson this year took out Gold, and also the Sustainability Award this year with Equilibrium, and it is no wonder with his very creative and clever thinking. He divided his display up into two comparative areas – one hosting concrete, exotic plants, and drains leading to storm water. 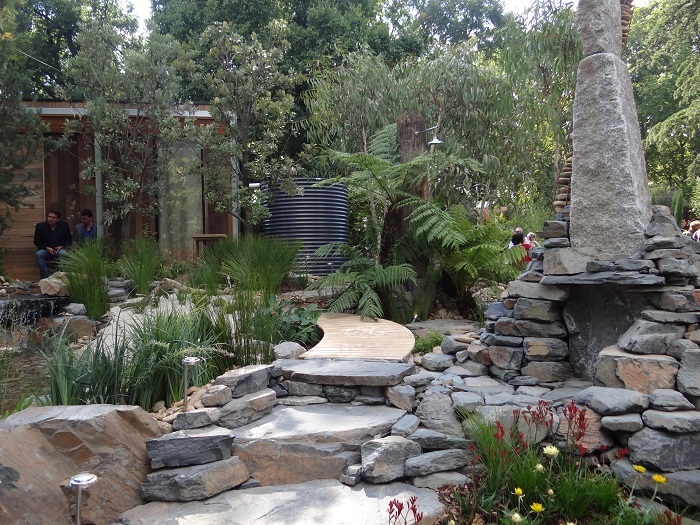 The other is a stunning sustainable landscape which contained a variety of native plants and the constructed billabong-style water garden. As well as being very pleasing to the eye, the garden is useful, as it is a water management system, designed to fluctuate; to overflow and dry out completely. The garden is also self-irrigating in that the water is able to soak though the soil. There were many Australian native plants used including various grasses, acacia, and anigozanthos. Interestingly enough was the use of a single hydrangea bush placed with it’s roots in the water to be a natural pH test (as it’s flowers changed colour). Through the use of water tanks, a veggie garden down the side, and a very well thought-out water system, this garden was sustainable, beautiful, and inspiring.